Anyone saying “Yes” to resuming the Myitsone Dam project on the Irrawaddy River in Kachin State can expect public fury at best and—it doesn’t seem like much of an exaggeration to say it—a death squad at worst. The controversial project is officially suspended, but recently returned to the center of public attention thanks to some undiplomatic remarks from Chinese Ambassador Hong Liang, delivered as he was meeting with Kachin politicians and religious leaders in the state capital, Myitkina. 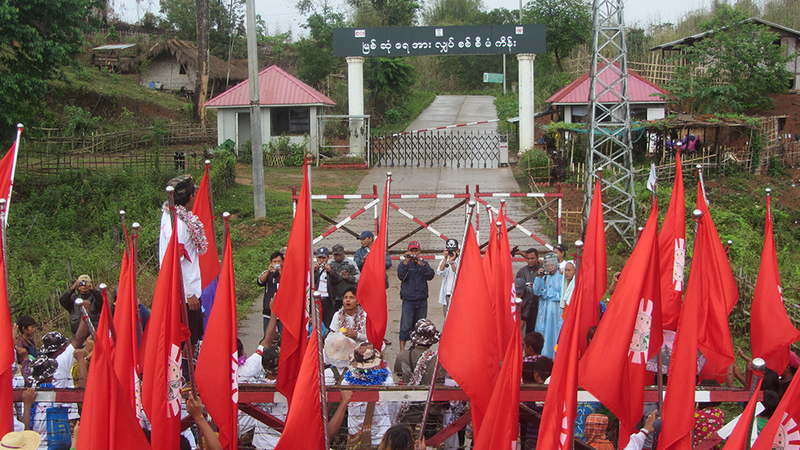 Hong claimed the Kachin people were not opposed to the dam’s resumption. Really? His remarks drew public outrage, but there has been no apology from the senior Chinese diplomat. To gauge public opinion in Myanmar we could call a nationwide referendum; China—with which we have nurtured a long-lasting relationship—would then be in no doubt as to where the public stands. If we believe in paukphaw (fraternal) relations between China and Myanmar, our Chinese brothers should know that the majority of people in this country oppose the dam project. But I can see at least one potentially positive development in all this: Since the majority of people oppose the controversial project, Myitsone is an issue on which all citizens can find some common ground, forging much-needed unity in the country. Government and religious leaders, politicians, lawmakers, activists and the public have strong opinions on the issue and will make it known to the world that they despise the project—this is healthy. The Myitsone controversy also offers a valuable lesson to us all; the contract was signed when the country was under the former military junta. In future, any issue related to mega projects will need to be handled with more transparency and accountability, and public participation is, as always, important. On the issue of Myitsone, the National League for Democracy-led government’s stance should be loud and clear. So far, however, the public is not satisfied with the government’s position. State Counselor Daw Aung San Suu Kyi recently said that no investor would trust Myanmar if a new government abolishes projects approved by its predecessor just because they do not comply with its policies. Her statement coincides with widespread concerns among the public over China’s attempts to resume the dam project after seven years. For reasons that are not hard to grasp, since the NLD came to power, her stance on this issue has become increasingly equivocal. She ordered the establishment of a committee to look for an appropriate resolution to the Myitsone Dam project. During her visit to China in 2016 she said she is willing to look for a resolution that “suits both sides’ interests”. Last week, U Thaung Tun, minister for investment and foreign economic relations, acknowledged that the China-backed project is dogged by major problems and has received nationwide pushback. “As we are the government, we are working hard to find a solution,” the minister said at a press conference during the Invest Myanmar Summit in Naypyitaw. The minister said the government and the commission set up by Daw Aung San Suu Kyi are in very serious discussions and considering all possibilities, including downsizing the dam, relocating it or developing other projects instead. He said the dam project as it was initially conceived under the previous government was “misguided”. So would Daw Aung San Suu Kyi say “yes” to the Myitsone project? Government leaders including the State Counselor realize that resumption of the dam project is political suicide. Recently, we have seen many brave people come out to protest against the dam project. One is the respected Cardinal Charles Bo, who said that the dam, which is slated for construction at the source of the Irrawaddy River, known as Myanmar’s lifeline, “must be stopped” to ensure a peaceful future for the country, adding that construction of the dam would be a “death sentence for the people of Myanmar”. The cardinal’s call follows a strong push by China to convince local people to support the project. His statement, titled “Stop Trafficking Our Mother Irrawaddy”, is timely. In it, Cardinal Bo told local authorities and the international community that Myanmar is facing the sad prospect of losing the Irrawaddy “to the greed of a superpower.” China, no doubt, will not be pleased. “On behalf of all the people of Myanmar, especially the poor farmers, we earnestly request all stakeholders to stop their attempts to abuse our Mother Irrawaddy,” the cardinal said in his statement. It was a wonderful statement that echoes the sentiments of millions of people in the country. Make no mistake: The public outrage against the dam project is gaining momentum and the government must listen to these voices. Certainly, whoever speaks out on this issue could make himself or herself a hero. And a surprising candidate has emerged! In a recent meeting of stakeholders in Myitkyina, Myanmar military chief Senior-General Min Aung Hlaing held discussions with Kachin religious leaders on IDPs, the peace process and the Myitsone project. The commander-in-chief, who has made no secret of his political ambitions in 2020, reportedly said it is hard to go against the public’s will on the dam issue, and promised that the Tatmadaw would do anything it can. But, he added, the final decision would be made by the Hluttaw, or Parliament. Without a doubt, introducing this hot-button issue into the sleepy Parliament will liven it up again. To be fair, Myanmar and China are neighbors, and Beijing is always in a hurry to assist whenever Myanmar faces a political or diplomatic crisis; the government’s recent efforts to strengthen ties with Beijing as criticism over the Rohingya refugee crisis pushes Myanmar away from the West are understandable. But Myanmar is still an independent nation, and China must respect this. Malaysia’s Mahathir Mohamad, who returned as the country’s prime minister at the age of 93 early last year, traveled to Beijing in August and said “No” to Chinese projects worth more than $20 billion, including the East Coast Rail Link, which was supposed to run down peninsular Malaysia’s eastern seaboard as part of Beijing’s Belt and Road Initiative. Likewise, the government in Myanmar can say “No” to past projects and renegotiate deals to reflect public opinion. Whatever amount of pressure the government is subjected to, and regardless of the challenges the country faces, it’s time to demonstrate that Myanmar is not a client state of any country and still exercises independence and a neutral foreign policy. Saying “No” to Myitsone will ensure the future of the country. The more China pushes Myanmar to resume the dam project, the greater the public outrage and fury it will face. When it comes to Beijing’s efforts to achieve a paukphaw relationship, this can only be counterproductive.